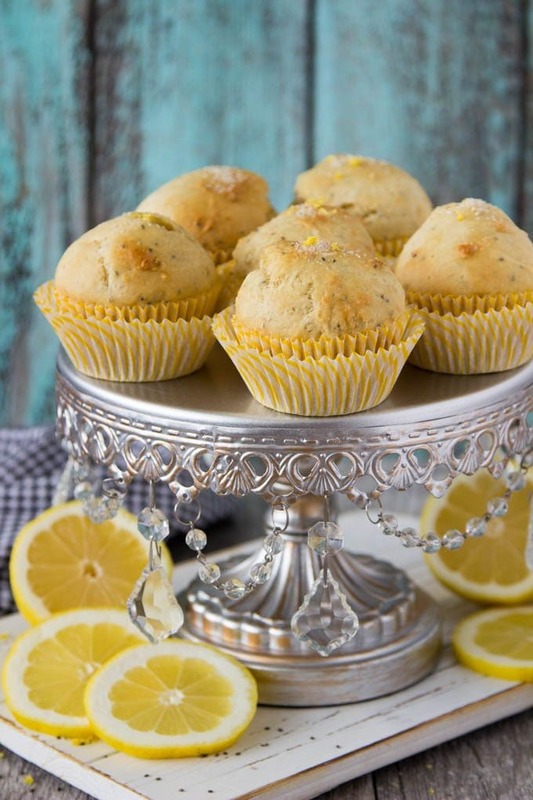 Super soft and fluffy healthy muffins with a zesty lemon flavor (and a hint of almond) . 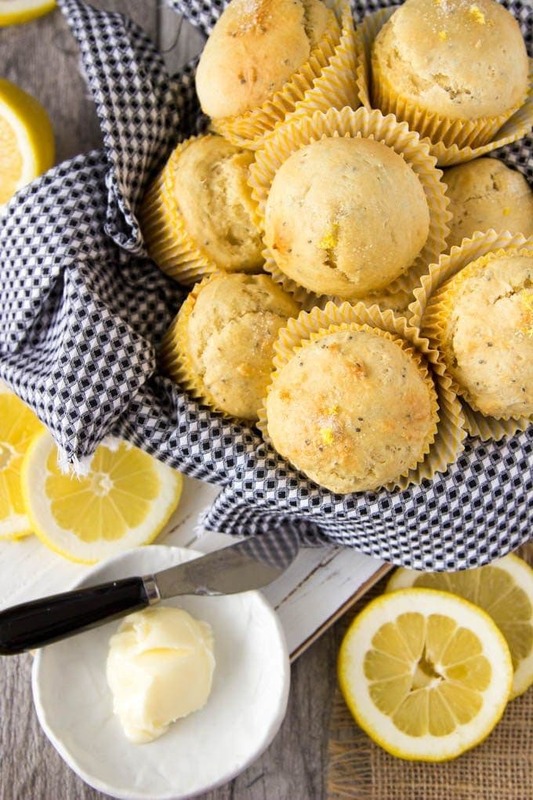 A healthier version of the classic lemon poppy seed muffin. Ready in less than 30 min. Perfect for a quick easy breakfast or snack. L..L.. L..L..Lemons! They make me so happy! For real… the smell of lemon has actually been proven to de-stress, clear your mind and brighten your mood. Not to mention that the bright, tangy citrus taste of lemons is A.M.A.Z.I.N.G! 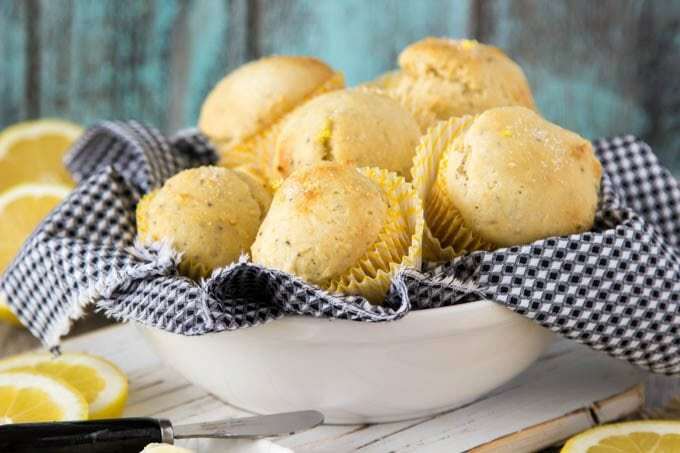 Add lemon to these healthy super soft muffins and I’m pretty sure you can double all that happiness! 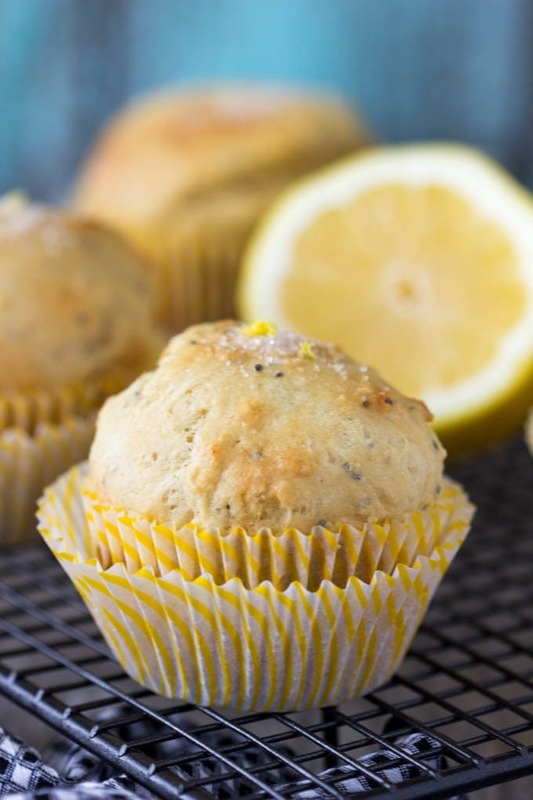 These Lemon Chia Seed Muffins are a healthier version of the classic lemon poppy seed muffin. The classic version is loaded with vegetable oil, butter and sugar (and therefore calories and fat) . This lightened up version is every bit as tasty but much lower in calories and fat. So how exactly do we get tasty muffins without oil and butter? By adding in ricotta cheese! Huh? Yep..it’s true, adding ricotta makes for super moist and fluffy muffins, as well as adding some protein. 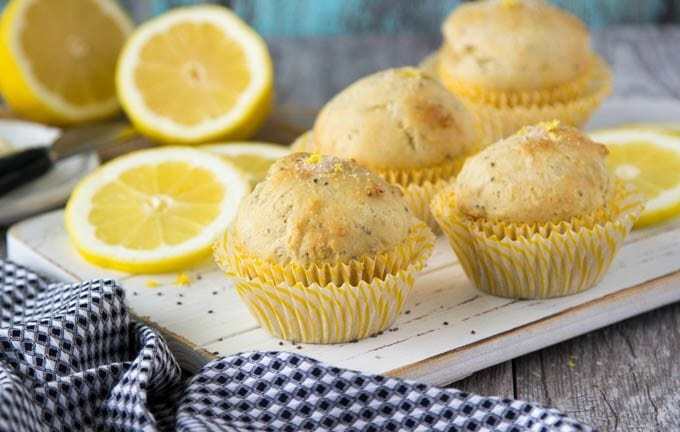 And…adding chia seeds ups the nutritional value of these Lemon Chia Seed Muffins. Chia seeds are a “superfood” and pack a huge amount of nutritional value in such tiny little seeds. They are loaded with antioxidants, protein, fiber and Omega-3’s. With only about 145 calories each and 5 grams of protein Lemon Chia Seed Muffins make a great quick breakfast or snack. Perfect for popping in a ziplock bag and throwing in you purse, lunchbox, backpack etc. A batch makes 12 muffins, but no worries if you can’t use all 12 right away. Freeze some for later. I like to use ziplock bags (2 muffins to a bag). Then they are easy to just take out of the freezer about an hour before you want to use (or defrost in the microwave). Muffins are great at room temperature or heated up in the microwave or oven (covered in aluminum foil if heating them in the oven) . Preheat oven to 350F. Line a standard 12-cup muffin tin with baking cups. In a medium bowl combine dry ingredients - flour, sugar, chia seeds, baking powder, baking soda and salt. In a separate bowl lightly beat egg with a fork, add ricotta, water, honey, applesauce, lemon juice, lemon zest and almond extract. and mix to thoroughly combine. Divide batter between muffin cups and bake until tops of muffins spring back when lightly touched (or until a toothpick inserted into the center of the muffin comes out clean) approx. 16-18 min.